The Predators possess technology far beyond that of humans. However, it is unknown whether they created this technology themselves, or obtained it from other species which have had the misfortune to be considered worthy of hunting. They are very protective of their technology, and will go to great lengths (including self-destruction) in order to prevent others obtaining it. It is also noted that Predators seem to 'personalise' their hunting kit to some degree, employing retro-fit weaponry or customised weapons systems, although most hunters would keep to the standard armoury. 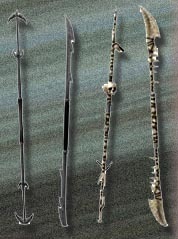 A typical equipment load for a Predator on a hunting safari would usually consist of the following items. While on safari, the Predators wear distinctive headgear which serves multiple functions. Various mask designs are used, which can vary greatly between both Classes and even individual Clans. They can range from a simple mask with no additional technological features, to a fully functional computer-aided hunting system. The standard helmet design offers protection during combat, and houses a respirator which provides (or supplements) a breathable atmosphere. It is also capable of being used underwater similar to scuba gear. Technological advantages offered by the helmets include filtering through many different visual settings such as Infrared, Ultraviolet, Thermal Imaging, Low-Light Amplification, Electromagnetic Field Detection and Air Density Pressure (movement). Additional vision modes include various diagnostic functions, to determine the health status of organic targets. Other visual settings can also include X-rays and Microwaves, with a built-in Magnetometer and a Geiger Counter. Also housed within the helmet is a targeting and tracking system for shoulder-mounted weaponry. This features an extensive array of surveillance equipment, such as a zoom capability to view and aim over great distances. The tracking system also allows the user to plot a moving object's trajectory. The helmet also features advanced audio decoding devices, to increase (or stabilise) the hunter's sense of hearing. Also included is a Waveform Analyzer which can record or playback audio and speech, in an effort to either understand an alien language -- or simply taunt their prey. This is a basic 'wire' mesh, worn under a warrior's armour. Apart from providing electric-generated warmth, it is actually a component of the camoflauge device's citcuitry which allows cloaking of un-armoured body parts. Although, as the mesh is seen being worn by most Predators even when cloaking isn't necessary, it seems they were designed as 'jumpsuits' meant for casual wear in their crafts - the closest they get to flight suits. Offers protection where the Predator needs it the most. Light and maneuverable, but is still vulnerable to heavy strikes. The ceramic plating is composed of a totally foreign compound (like other materials) and some are capable of resisting acidic Xenomorph blood. Ceremonial Armor is usually reserved for the upper classes and the elders, only found on the leader of the team. This interchanging and decorated plate armour is somewhat clunky, more for show than heavy-duty defense. The Yautja camouflage is the ultimate in stealth technology. By bending light waves around the cloaked object, the device makes it practically invisible. 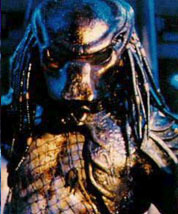 The device is used to mask Predator ships moving within enemy territories, as well as individual hunters themselves. While effective against most prey, the camouflage doesn't grant true invisibility. An alert opponent would be able to notice the heatwave-like shimmer while the wearer is moving, especially noticeable when they move in front of bright light such as fire. The camouflage is also rendered useless against the keen senses of Xenomorphs. The camouflage suit does not function well (if at all) immersed in water, and may be ineffective in enviroments saturated with material surrounding the wearer such as fog, rain, or dust. Any damage caused to the central electrical system can also disable the cloaking device. Only mounted weapons are effected by the cloak. This includes concealed weapons like retracted wrist blades, collapsed spears or other weapons kept hidden by backpacks and so forth. Once extended or revealed, the weapon is visible. The medikit is an indespensible item of the hunter's inventory. It includes wound staplers, surgical blades, a crystallised-medicine burner, emergency breather and surgical hypodermics. The medkit contains enough tools and supplies to perform minor surgery and repair superficial wounds, extract bullets and shrapnel, or even cauterise a lost limb. While short on pain killers, the kit is highly effective. The sat-com is a computer housed in the wrist console, which projects holographic schematics of a particular object or building. As well as functioning as a global positioning unit, the sat-com can also display the position (and damage radius) of mines or laser nets in the area. The Wrist Blade is the weapon of choice for most Predators. Twin blades (or occasionally triple blades) with jagged double edges and sharp enough to tear through bone, are effective against large and small opponents. 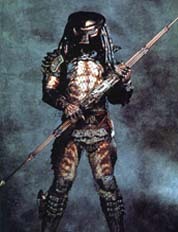 Using the Wrist Blades show Predator pride, because they prefer melee combat fights -- face to face. The blades range from anywhere between 12 and 18 inches long and are retractable from a wrist gauntlet on the arm. They are forged from an unknown alloy which is almost unbreakable, but not totally immune to acidic Xenomorph blood unless properly treated. 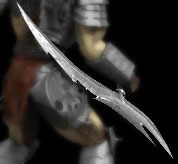 A variant of the original Wrist Blade design is very similar in both design and operation, although the length of the blades themselves can match an extended weapon such as the Maul. The Arm Blades are housed in a gauntlet much larger than the standard Wrist Blade gauntlets, and may limit the options for additional gauntlet devices. The Plasma Caster is a mounted and lightweight weapon capable of firing multiple long-range energy burst of charged plasma. The power of the plasma burst can be adjusted manually, ranging from a minor setting to a blast powerful enough to breach interstellar craft. The plasma caster is controlled via a targeting system in the helmet, and tracks with the head movement of the firer. 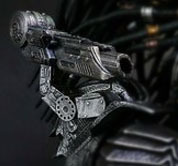 It can be used with a Laser Sight to increase targeting capacity, and is fired either by a mandible-controlled trigger in the helmet or by the forearm-mounted control panel. The tracking servos of the Caster are some of the most vulnerable articles carried by the Predator, being easily damaged; although some models can be used as a hand-held weapon in the event of tracking failure. The speargun is similar to a sniper rifle and can be fired from great distances, instantly killing victims. It can also attach their flesh, like a nail-gun, to a wall or solid area. There seem to be more then one model of the Spear Gun. The original design was seemingly built-in as part of the armor or gauntlet - similar to the Gauntlet Plasma Bolt - while the newer version is a separate hand-held pistol, possibly even ranged with visual scopes. It is the perfect silent ranged weapon, with some types of the weapon capable of firing multiple projectiles at opponents. This is undoubtably a retro-fit weapon installed by the warrior, as the weapon's use has only been recorded once. His choice was a Wrist Gauntlet projectile - either some type of self-propelled rocket, or more likely a plasma energy bolt. This was the only remaining projectile weapon remaining after the warrior's Shoulder Cannon was disabled. The Net Gun is small and usually reserved for ambushing a group of prey, when entering a major combat area and the temporary incapacitation of a subject is necessary. The net gun is not a projectile weapon, instead launches a web of razor-sharp wire powerful enough to propel a target to the floor/wall and pin them there, viciously cutting into the flesh. If the target tries to struggle the damage increases, and this keeps up until the subject is released or is killed. 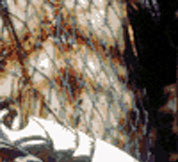 The net can also release on a trigger from the weapon. The Combi-Stick is a self-powered telescoping spear that is merely one meter at its shortest length, but extends by two meters at each end. The combi-staff makes a formidable weapon for close range attacks, due to its length customisation. It can also be thrown, to puncture through a target. Made of nearly unbreakable alloys, sharpened tips on either end produce electrical charges as it slices through any surface. One of the most advanced pieces of equipment carried by the Predators, the smart disc is internally powered and can be held in the hand, or thrown at an opponent. This device is capable of cutting through most substances with its devastating razor edges, and is powerful enough to cut through multiple targets with one throw. 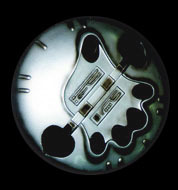 Computer-controlled gyros guarantee that the disc returns to its wielder, but if it becomes embedded in a solid material it can be returned by the push of a control-panel button. Another advanced piece of technology, very similar in characteristics to the Smart Disc. The Shuriken is carried and transported as a flat circular device, but the push of its surface transforms it into a multi-pointed, sharp edged throwing star. Also like the Smart Disc, it is self-charged by an internal power supply. The Shuriken can be thrown at an opponent, or used in hand-to-hand combat if necccesary, cutting through many substances with its many razor edges. 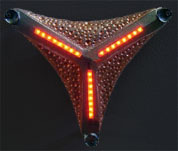 When thrown, internal computer-controlled gyros (or possibly a remote homing device) returns the Shuriken to its wielder. The Ceremonial Dagger is a relatively new discovery, associated with the Blooding Rites of young Warriors. Its primary use is to remove the protective layer of skin of a Xenomorph, but could also be used as a close-contact weapon if need be. 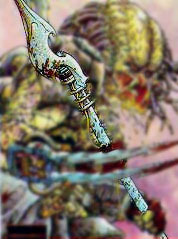 The Blade itself is made of either the bones or the 'resin' of a Xenomorph, making it resistant to their acidic blood. The laser net is a flat triangular-shaped device that, when deployed, automatically secures itself against a solid surface. When remotely activated, the device produces beams that spans a void until making contact with another solid surface. The lasers do not damage that surface, only slicing through organic materials. When two or more nets are placed across from each other they create a laser 'grid', allowing nothing through but the smallest of creatures. A segmented hand-held bull whip that wraps around a target, and once pulled taut is capable of cutting it in half. 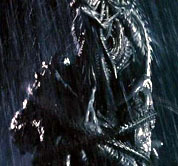 Resistant to Xenomorph acid, due to its possible construction of a Xenomorph's tail. There are many uses for the wrist console panel, such as changing vision modes, firing the Plasma Caster, or accessing the Sat-com; but its final use comes when the hunter is mortally wounded or inescapably trapped -- the self-destruct mechanism. This weapon of last resort is used by warriors both as a method to perform honourable suicide to keep their honor in death, and also remove any evidence of their existence. After the device has been set, decreasing numerals on the wrist console serve as a warning that the bomb is about to explode. There is a short countdown until the detonation of a micro-nuclear explosion, destroying an area equivalent to 300 city blocks. 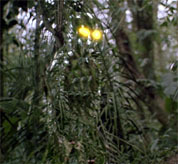 A similar device is also found on Yautja spacecraft, again due to their custom of self-destruction rather than capture. The Naginata is part weapon, part ceremonial trophy, of many different types and designs. It is a beautifully plated and encrusted pole arm with double-ended cutting surfaces, an image of honor and demands respect when brandished. Each end is a super-sharp collection of blades causing devastating damage if struck upon a hapless victim. The blades can flawlessly cut through almost any substance and also has a conducting field which allows it to be cloaked when in hand. When the weapon strikes, however, it becomes visible. The term 'Burner' can refer to a number of weapons. One definition is a weapon similar to a flamethrower, meant for mass attack. Another reference is to a long rifle with a trigger button, effective even against xenomorph queens -- being too powerful for normal hunts, they are only used inside alien hives or for general warfare. 'Burner' can also be used as a term for any plasma-based ranged weapon and is frequently used to describe any type of firearm, especially those of humans. The Glaive is very similar to the Naginata - and may even be the same weapon, but adopted by a particular clan and personalised to each bearer - and is a very effective long-reach polearm. It is twin-headed, capable of being spun a high speed and delivering a rotating barrage of slashes to an opponent. The Maul is another weapon of personalised design. It may vary greatly in appearance, but its general usage is the same - used in similar style to a sword, but its power is greatly increased by its counter-balanced design. Mostly created from a forged alloy and double-edged, the Maul is capable of being used as a slashing weapon in all arcs of movement; but it can also be spun like the Naginata, to rain a barrage of blows onto a target. Other designs are reminiscent of the 'mace heads' or 'morning stars' of the gladitorial era - either solid material with protruding spikes, or forged from a metallic alloy and covered in pointed nail-like objects.